Bhubaneswar: The State Government has started imparting education in 10 Adivasi languages in 12 districts and has planned to introduce 10 more tribal languages in 10 other districts in coming days, said Women and Child Development and Social Security and Empowerment for Persons with Disabilities Minister Prafulla Samal on Monday. 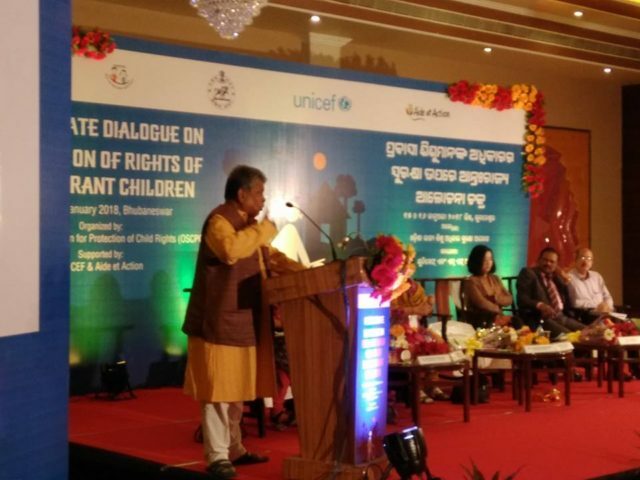 Inaugurating a two-day ‘Inter-State Dialogue on Protection of Rights of the Migrant Children’ organised by the Odisha State Commission for Protection of Child Rights (OSCPCR) in collaboration with the Unicef Odisha and the Aide et Action, Samal said children are getting education in their mother language in the State. Samal said as per reports, the State has achieved a 76-per cent literacy rate till now; and by 2020, it would be fully literate. Focusing on many labour laws, he said making law is not sufficient, but how far it is implemented is more important. “We are serious about the children of migrant labourers and steps have been taken to provide them qualitative education by creating seasonal hostels under the Sarva Shiksha Abhiyan,” he added. He also said there are around 61 lakh children in State and there are around 52,000 primary and upper primary schools. In other States, there are not so many schools considering the students ratio. As per the 2011 Census, about 400 million people in India are migrants. Of these, about 25 per cent migrate seasonally. Informally, 15 million children migrate in India. During the two-day meet, discussions will be held on some of the critical issues affecting the migrant children with Government agencies and civil society organistions of nine States. Odisha Building and Other Construction Workers’ Welfare Board Chairperson Subhash Singh, Unicef Odisha chief Yumi Bae, OPEPA State Project Director Mahendra Mallick, OSCPCR Chairperson Kasturi Mohapatra, Kalyan Rath and State Commission for Women Chairperson Lopamudra Buxipatra also spoke at the meet on Monday.